2 Weekends, 4 Cities & 7 Shows?! This Just Might Be the Ultimate Music Experience in M’sia Yet! What’s better than a weekend of heart-pounding music? Two, of course! It’s almost hard to believe that another year is coming to an end. Soon, Malaysians around the country will wave goodbye to 2018 and raise a toast to a new year. All things considered, it has been a year filled with accomplishments to be celebrated and memories to be cherished, especially for music lovers. Festival goers, in particular, were treated to unforgettable music experiences and watched global music icons such as Lorde and ODESZA grace the stage of the Good Vibes Festival hosted by Heineken®. Well, what if we told you that you can usher in the new year with back-to-back weekends of non-stop music across four states this December? If you haven’t guessed it already, we’re talking about Heineken® Live Your Music, a music journey like no other which will once again play host to global music icons. 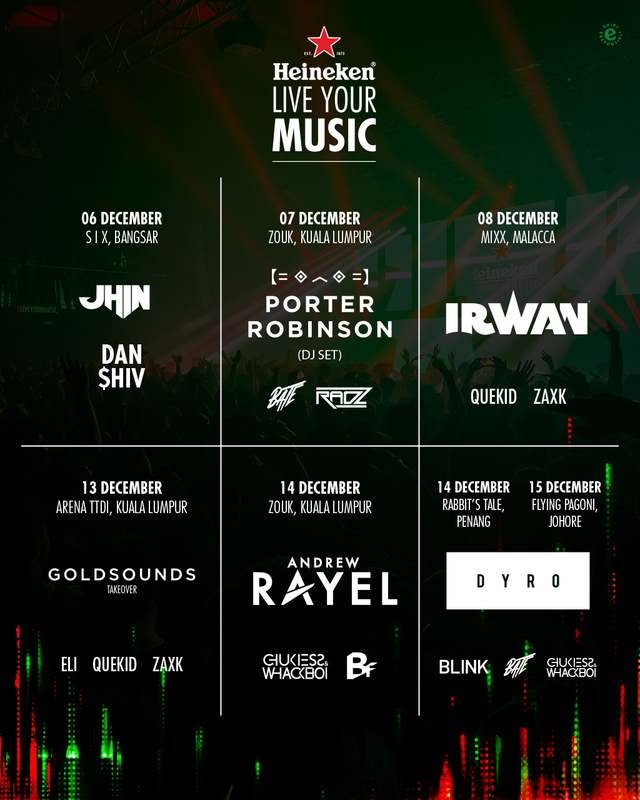 Since its debut in Malaysia, Live Your Music has been the home of earth-shaking music parties featuring world-class international talents such as Tiësto, Zedd, DVBBS, MaRLo, and many other rising stars in the industry. This time around, music fans from around the country can usher in the new year with a host of international talents in Kuala Lumpur, Penang, Johor Bahru, and Melaka in two back-to-back weekends! 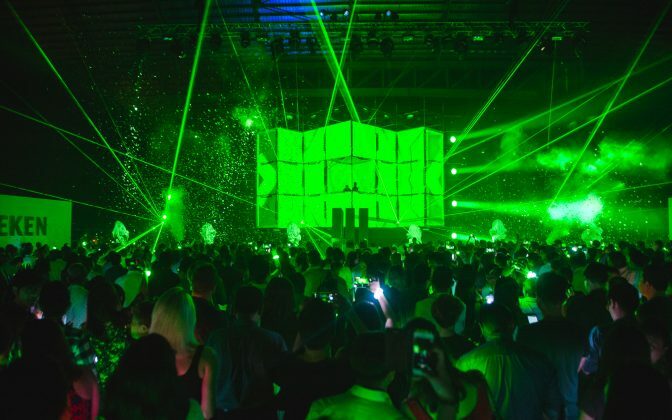 Each of these shows will feature Heineken’s Green moment which is the brand’s signature music experience custom-designed to enhance and elevate the way its consumers enjoy their music. Here are all the exciting talents coming to Malaysia this December. Entirely self-taught, Porter Robinson began producing music at the tender age of 13 under the alias Ekowraith. Much of his early tracks were inspired by his passion for anime, Japanese culture, and video game music – Dance Dance Revolution in particular. Porter quickly gained international recognition when he signed onto Skrillex’s OWSLA label and success quickly followed. 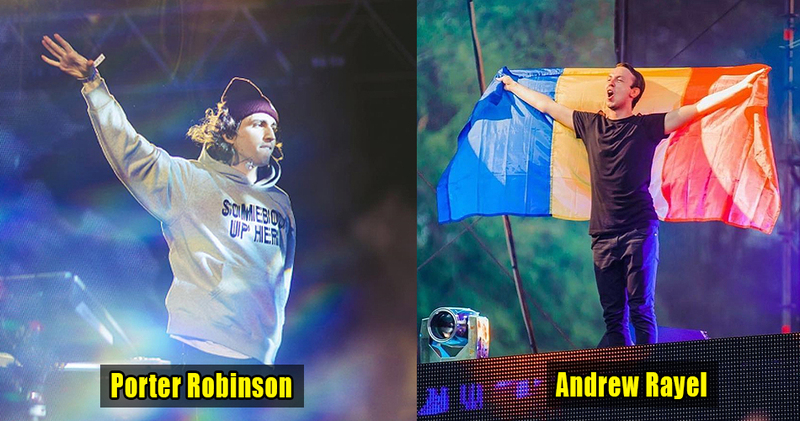 Today, the American-born Music DJ is widely known for his “Worlds” album and collaboration on Shelter with French DJ and record producer, Madeon. Be sure to check out his first-ever performance at Zouk this December. Deets below! Moldovan-born Record Producer/DJ, Andrew Rayel, is another big name who needs little introduction. Throughout his career, Rayel has been a prominent figure in the Electronic Dance Music scene performing at notable music festivals such as Ultra Music Festival and Tomorrowland. He has worked alongside other big names in the industry reworking tracks for Tiësto, Hardwell, The Chainsmokers and many others. In 2017, Rayel also released his very own record label, inHarmony Music as a platform to showcase fresh talents in the electronic music scene while releasing his tracks. Itching to “find their harmony” alongside Andrew Rayel this December? Deets below! Jorgy Van Egmond, or more commonly known by his stage name, Dyro is a protege of Record Producer and fellow compatriot, Hardwell. Best known for his hard-hitting and raw electro DJ style, Dyro is regarded as a dark horse of main stage EDM through the release of his very own WOLV Records Label. In 2016, his ‘Set Me Free’ EP saw a collection of rough and gritty releases, which were widely acclaimed. Music fans itching to catch Dyro live this December can watch him perform in Penang and Johor Bahru as he conducts a remarkable sprint across the country. Deets below! DJ Irwan’s reputation as one of the best hip-hop and open format DJs in Europe precedes him. Born and raised in Holland, Irwan has rubbed shoulders with countless international stars including Justin Timberlake, Janet Jackson, Lil Wayne, and Flo Rida to name a few. This December, Malaysians can witness his unique skill of blending a range of genres including rap, hip-hop, trap, and EDM; after all, this is what made him a crowd favourite and one of Holland’s most exciting up-and-coming stars. The fun doesn’t stop there as Malaysians can also catch Jhin and Dan $hiv perform at Six, Bangsar on the 6th of December while Goldsounds Takeover will be performing at Arena TTDI, Kuala Lumpur on the 13th of December. What’s more, Heineken® will also be announcing a series of innovative crossovers and collaborations with some of Malaysia’s leading creative influencers and tastemakers to elevate the music experience further. Catch legendary Heineken® collaborator DJ Goldfish as he shines a light on the rising stars of Goldsounds Academy. Experience the future at the 10th anniversary of the kaleidoscopically inventive LAH’LAH’LAND, a hub for forward-thinking individuals to share their passion for music and fashion. Watch dance icon MayB Wong and her crew freestyle their way on the dancefloor. More information on Heineken® Live Your Music can be found here. Be sure to keep yourself up-to-date with Heineken’s social media platforms on Instagram and Facebook for more upcoming surprises. Well, we sure know where we will be ushering the new year! Hope to see all of you there!